Fabric Inspection Machine with optional data collection and analysis system (4-point system) to handle a wide range of rolled woven materials. ST-WFIM Fabric Inspection Machine with optional data collection and analysis system (4-point system) to handle a wide range of rolled woven materials.This machine can be supplied to operate from plait/loose fabrics to roll, or with various other fabric inlet and outlet options. 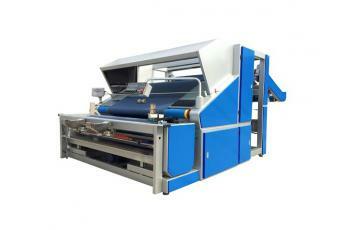 NEWLY DEVELOPED AUTOMATIC FABRIC INSPECTION (CAMERA), LABELING, CUTTING, TAPING & PACKING M/C. This will allow for continuous fabric inspection, from one piece of roll to next. Edge alignment photo-sensor for perfect roll generation. Processed rolls are rewound with the correct amount of tension and are consistent from roll to roll. Optional systems are available for different fabric input and output presentations, roll to roll, continuous fabric input, etc. Ideal for for Thick/Sulzer Selvedges.